I can’t remember when or how I stumbled across dolce de leche but I’ve been a huge fan ever since. Dolce de leche is sweetened condensed cream cooked until it caramelizes. It’s basically heaven. AND it’s astonishingly easy to make. I mean, I’m sure if you did it the traditional way it would be agonizing, but all I do is put the entire can (unopened full can) in a pot of boiling water and keep it boiling for 3 hours. Now, disclaimer, you must keep the water over the can. If you don’t the pressure can change and I’ve heard the can explode. But I’ve made it countless times and I have never had any problems. Just put the can in the pot cook it for 3 hours and then let it cool before opening. It’s really that simple. And you will be left with beautiful creamy caramel sauce. Sauce that makes coffee into something extraordinary. Sauce that, thinned with a little cream, is exceptional over pancakes or waffles. Sauce that, mixed with a little cream and a little icing sugar, makes the best icing ever. Or you can sandwich it between shortbread cookies, or swirl it into ice cream. The options are endless and they are all delicious. We went to a friends for dinner last night and (because now that I have a blog I need to pawn deserts off on people) I brought desert. I made some dolce de leche earlier in the week so I thought I’d use that because I knew our lovely hostess Liz loves it. Now this desert maybe seems like a lot of work but I assure you, it took me less than an hour including baking time to make it all. The pot de crèmes are so easy to make and to transport which is always important. I made mine in ramekins but if you have oven proof tea cups or espresso cups those would be charming. I made some coconut lace cookies with them because I always think something creamy needs something crunchy. In fact, if you have a blow torch you could easily make these into a crème Brule but I don’t so I made a cookie instead. These cookies are fun too because once they’re baked but still warm they are very pliable so I wrapped mine around a rolling pin ad they get nicely curved. And I doubled the salt from the original recipe to ofset the sweet of the dolce. And then because everything was so sweet I made a compote with blood oranges, although of course you could use any citrus you wanted to. And guys, it was super good. 2 strips of Lime Zest. · Bring several cups of water to a boil. · Bring cream and zest up to a boil. · Meanwhile mix egg, yolks and dolce de leche. It will be a little hard to mix, I recommend a whisk. · Add cream into egg mixture very slowly so that you don’t cook the eggs, whisking the whole time. 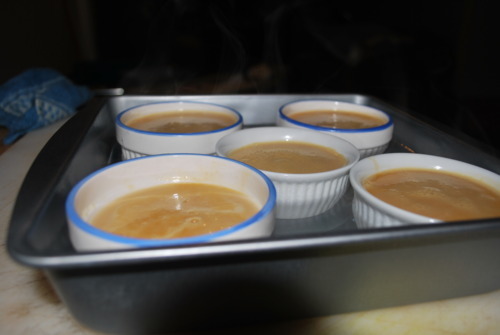 · Pour mixture into ramekins or other individual oven proof dishes. 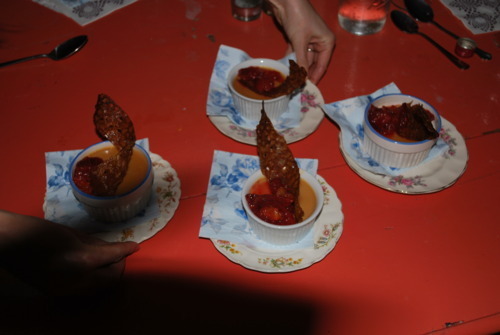 · Pour boiled water into dish being careful not to splash any into the ramekins. · Cover with tin foil and poke a couple holes in it. 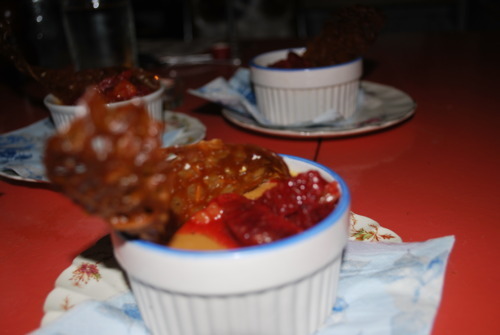 · Bake for about 30 minutes or until the custards seem thicker but still wiggle a little in the middle. · Cool at room temperature for about an hour and then transfer into the fridge. · Bake on a parchment lined sheet until bubbling throughout and starting to caramelize around the edges. These cookies will really spread out so you can only do 4 per sheet. Mine all bunched up together so while it was still warm I cut them into strips. This seemed to work pretty well. 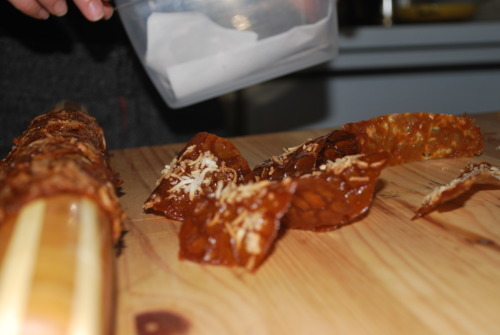 · Sprinkle coconut on top and bake again for another minute until coconut starts to brown. · While still hot you have the option of squishing them into fun shapes, draping them over a tea cup to make a bowl or rounding them over a rolling pin which is what I did. You have to work quickly because they become brittle as they cool. If they don’t turn brittle as they cool, put them back in the oven for a minute or so. · Bring juice to a boil and reduce until barely a syrup. · Pour over orange and taste. If it needs a little sugar add it!